Not everything is about Spanish: have a blast after class! 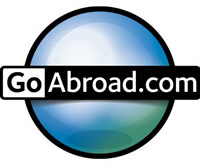 Volunteering: language travel with social impact! 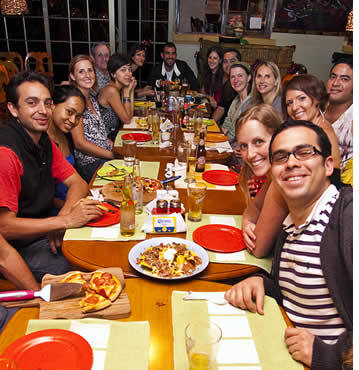 Panamanian Dinners Parties: on Tuesdays delight yourself with Panama's cuisine. Movie Nights: Wednesdays are for movies in Spanish. Weekend Get-Togethers: starting on Thursdays we'll go out to local restaurants, bars and clubs to PARTY! Latin Dance Lessons (Salsa & Merengue): on Saturdays we learn the latin rhythm. Conversational Sessions: every Saturday practice your Spanish in a relaxed environment. The following are FREE extra activities at our Spanish schools in Panama City, Boquete and Bocas del Toro: Latin Dancing Lessons, Conversational Sessions, Movie Nights and some Get-Togethers. Our weekly Traditional Panamanian Dinners cost $7 USD per person, Yoga Classes cost $5 - $10 USD per class and the Eco-Adventure Tours have their own fees and students pay their own expenses when going out to a bar, restaurant, poker night, field trip, excursion, etc. Experience Panama's Mountains, Beaches and the City at their Best! Hiking, Trekking, Caving, Wildlife & Botanical Expeditions: to the famous Quetzals Trail Path, the Baru Volcano Hike, Sendero El Pianista, La Artilleria, La Novia de la Montaña, Island Paths, Jungle Hikes and Caves in Bastimentos and Isla Colon plus more secret trails full of views, waterfalls and wildlife. 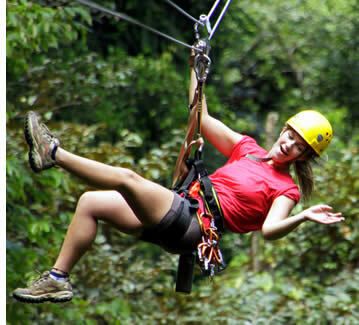 Zip Line Canopy Tour in Palo Alto's cloud forest near Boquete and in Isla Bastimentos near Red Frog Beach. Whitewater River Rafting in Chiriqui's world class rivers - Panama's rafting capital. Rock Climbing & Rappelling at Los Ladrillos in Bajo Mono, Boquete. Surfing in Bocas del Toro (Paunch, Dumpers, Bluff, Wizard, Carenero, Black Rock, Old Mans, Silverbacks, Long Beach, La Curva, Tiger Tail, Tuna, Waikiki) and in the Chiriqui Gulf (La Barqueta, Morro Negrito, Puerto Armuelles). Horseback Riding along the beaches of Isla Colon or in the valleys of Caldera. Bike Tours in and around Boquete and Bocas del Toro. Scuba Diving & Snorkeling in Bocas del Toro at Crawl Cay, Hospital Point, Cayo Zapatillas, Tiger Rock and other dive sites Panama's Caribbean, and in the Chiriqui Gulf National Marine Park and Coiba Island in the Pacific. Farming Tours to visit Boquete's coffee plantations and processing mills in Alto Quiel, Jaramillo and Palmira, and to the Cacao (Chocolate) Farms in Bocas del Toro. Indigenous Villages visit local communities such as Soloy in Chiriqui and Salt Creek in Bocas del Toro to learn more about the local culture and way of life. Hot Springs & Petroglyphs Tour in the wild region of Caldera. Beach Trips, Boat Tours, Catamaran Sailing, Sea Kayaking and Island Expeditions to Gamez, Paridas, Paridita, Bolaños, Las Lajas, Santa Catalina, Secas and Ladrones in the Pacific and to Dolphin Bay, Crawl Cay, Bird Island, Hospital Point, Red Frog Beach, Playa Larga, Solarte, Escudo de Veraguas, Starfish Beach (Bocas del Drago), Bluff and many more islands and beaches in Bocas del Toro in Panama's Caribbean. Our students get discounts for many ecotourism and adventure activities in Boquete, Panama City and Bocas del Toro. Boquete is Panama's Ecotourism capital, Panama City is Latin America's most cosmopolitan city, and Bocas del Toro is Panama's #1 Beach Destination in the Caribbean. Wherever you decide to study Spanish in Panama you'll be studying in paradise and there will always be a new adventure waiting for you. 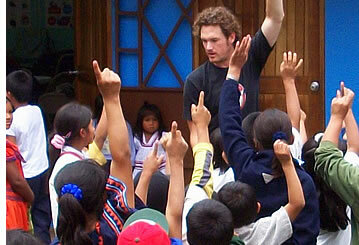 If you want to help others during your time in Central America, we'd be more than happy to make it happen! Working together we create opportunities for those who would not otherwise have them and we build bridges to self-sufficiency, personal growth and human happiness. We assure you that taking the step to volunteer in Panama City, Bocas del Toro and/or Boquete, Panama will change your life and the lives of others. When choosing where to travel in Central America to study Spanish and continuing or intensifying your yoga practice, look for a school where there's an active yoga community and different yoga studios to choose from. Every day of the week Habla Ya Spanish students can join Ashtanga, Hatha, Vinyasa, Anusara or Restorative Yoga sessions. Daily yoga classes are organized by different members of our communities in Bocas del Toro, Panama City and Boquete, and you'll even be able to practice your Spanish at the same time as some yoga lessons are held in Spanish. It's a great way to expand your vocabulary, learn commands and get you in the best mindset to tackle the skill of learning a new language. Boquete's daily yoga classes take place at the Yia Yoga Studio as well at other superb locations only a short walk from Habla Ya Campus Boquete, such as The Butterfly House (yes, with actual butterflies around you), The Haven Spa or at Isla Verde, all of which have stunning setups for practicing yoga surrounded by nature. Yoga classes in the Bocas del Toro Archipelago happen at the Bocas Yoga Studio with Laura Kay, at The Genesis Creativity Center and at Espacio Abierto. All of these options are within a 15 minute walk to our Bocas school. There are also yoga classes in the Island of Bastimentos. Yoga classes in Panama City are arranged at It's Yoga Panama. This modern yoga studio is about a 10 minute walk from our Spanish School in the city, easily accessible from Via España. As in any major city there are multiple yoga studios to try out. Learn the Spanish language and lead a healthy lifestyle with daily yoga classes, meditation and relaxation sessions. Different types of yoga classes are offered throughout the week. You can practice yoga in the morning or in the afternoon to fit around your Spanish class schedule and eco-adventure tours. There is something for all yoga levels! And besides our daily yoga classes, we also organize Yoga Retreats that take place in different parts of Panama such as Cerro Punta, Azuero, Bocas del Toro or in the Chiriqui Gulf National Marine Park (for Bikram Yoga). Yoga classes in Boquete cost $6 - $10 USD per person. Yoga classes in Bocas del Toro cost $5 - $10 USD per class. Yoga classes in Panama City cost from $10 - $15 USD per class and they also have monthly packages of unlimited classes. Specific cost per class depends on instructor and length of class. Mats can be rented at $1 per session or you can bring your own. Certain Yoga classes are 60 minute long sessions, others are 1 hour and 15 minutes, and yet others are 1.5 hours. Private yoga classes can also be arranged upon arrival (please contact us). Practicing Yoga will improve your physical and mental health. Develop your flexibility, strength, and balance. Reduce the impact of stress, increase coping skills, vitality and improve the health of your joints and your immune system's functioning. Reduce the symptoms of many chronic diseases, strengthen your cardiovascular system, improve digestion, metabolism and hormone production. Alleviate depression and anxiety, increase your feeling of health and well being, promote weight loss and weight regulation. Improve athletic performance in all endeavors and allow a greater sense of clarity and concentration in your daily life. AND... get in the best possible frame of mind to learn Spanish fast! Have you ever wondered how some traditional Panamanian dishes like "Sancocho", "Patacones", "Arroz con Pollo" or "Tamales" are made? Or would you simply just like to eat some yummy traditional Panamanian dishes? Well, why not put those culinary curiosities to the test by participating in our Traditional Panamanian Dinners! You'll not only learn how to make these yummy dishes first hand and take back home a couple of delicious recipes but we also guarantee a night full of laughter, sharing and loads of fun as you interact with your Spanish teachers, our host families, your friends and fellow classmates from all around the world. And once in a while a change is nice... so when there's a great chef in town, be it one of our Spanish students or just a friend visiting us from Panama City, we organize International Dinner Parties! In the past we've had Sushi, Thai, Indian, Italian and Middle Eastern Dinner Nights... so if you're a great chef and you're heading our way, just let us know! Every Tuesday we get together at the school's cafeteria or at one of our host family's houses. Everybody puts $5 - $7 to buy the ingredients and those who are skilled cooks take charge. We assure you'll be up for seconds 'till your belly is filled. So, come and experience a relaxing night filled with good food and laughter after a day of arduous studies. Everyone is invited! Watching movies is an incredible way to practice Spanish. Try it out! You do not have anything to lose and at least you'll enjoy yourself because we only select movies that are pure art and that by themselves are extremely entertaining. Depending on the viewers' Spanish level we sometimes watch movies in Spanish with English subtitles and sometimes we watch movies in Spanish with Spanish subtitles. Watching a movie will help you gain more vocabulary. By listening to other accents you'll become more accustomed to them and your listening abilities will also improve. Listening to slang from different parts of Latin America within a movie will help you understand them as they'll be placed in specific contexts. Some of the movies that we watch are: Amores Perros, Habana Blues, El Mariachi, Romero, Bajo La Misma Luna, Pretendiendo, Volver, Maria llena eres de Gracia, Vicky Cristina Barcelona, Como Agua para Chocolate and many others. Every Wednesday we invite all our students to watch a movie within our TV & Chill out area. If you're a cinema fan, you'll also enjoy the discussion after the movie. You'll be able to practice your speaking abilities and how to use the language to defend a point of view, although if you do not have that much of a domain over the language, you'll be allowed to express yourself in your own language (and hopefully we will be able to understand you). Hit the beach: in Boquete and Panama City we are only one hour from beaches in the Pacific, and in Bocas del Toro we have loads of beaches to choose from! How do we know what you would like to do? Simple: we are just like you! We love to enjoy life because we only have one life to live! The average age of our Spanish staff is 28 and the most senior member of our staff is only 39 years (the youngest is 22). At Habla Ya Spanish Schools you'll be sure to find a place full of young but experienced professionals who know how to enjoy themselves and have fun. Learn to Dance like a Latin@... or at Least Try! The idea is to show you the basic steps involved in dancing Salsa and Merengue. Once you get your feet moving as they should, we help you out with your hips and the rest of your body. At the beginning it can be a bit difficult but it's nice to share a few laughs and get our bodies moving. It is a really fun way to get to know your teachers and classmates in a different way and if you plan to go clubbing during the weekend you should definitely consider learning some moves if you're the average foreigner who has never danced to the Latin rhythm before. One of our first Academic Directors, Irma Changmarín, had a Salsa & Merengue Dancing School and that is how the tradition of Latin Dancing lessons began at Habla Ya. Classes are held every week on Saturdays. We cannot guarantee that you'll be able to move your body as smoothly as Erica or Janeth (two of our Spanish teachers that really know how to move it!) but we will make sure that you're not mistaken for a typical gringo that does not have an idea about how to dance latin music. The dancing lessons on Saturdays are free of charge for our language students (in Panama City there is a fee for this activity). If you would like to have additional Salsa or Merengue lessons they can also be arranged at an extra cost. Additional dancing lessons for groups of up to 10 students cost $3 per person per hour. If you would prefer to have private lessons (3 persons or less), the cost is $10 USD per person per hour. Classes given at a different location from our school but within Boquete or Bocas del Toro cost $5 USD per hour for group lessons (4 persons or more) and $15 USD per hour for private lessons (1 to 3 persons). For non students the prices are $5, $15, $7.50 and $20 per hour respectively. Our teachers will tell you to practice, practice and practice, and that is exactly what you'll be able to do in our conversational sessions. Each Saturday we invite all our students to get together and simply talk. We make small groups of 4 to 6 people with a local speaker in each one of them and start talking about our Spanish lessons, sharing learning tips, telling each other what we have done in Boquete, Panama City or Bocas del Toro and what we plan to do for the rest of our vacation or we just talk about anything that we feel like talking about. Even if there is no reason to be shy when speaking the language that we are just starting to learn, the truth is that many people are shy and we have to help our students lose that shyness as soon as possible because it does make a huge difference if you feel confident and comfortable when speaking Spanish. Sometimes we are shy when it comes to talking, we are afraid of making mistakes, so the best way to beat that feeling without getting uncomfortable is to get together with people who feel the same, and that also want to practice, and that will probably be making the same mistakes. Learning Spanish is an incredibly fulfilling experience because it opens doors to so many new worlds. We believe that the most wonderful world it opens doors to is the world inside each Spanish speaker and this is why we place so much emphasize in the speaking ability in most of our Spanish courses. The Habla Ya Vibe: Relax, Chill Out and Have a Good Time! When you're enjoying yourself and having fun you certainly learn the language a lot quicker. Through our extra curricular activities our Spanish students have the opportunity to learn new things about the Panamanian culture, share with their teachers and classmates, have a wonderful time and without even noticing it they'll also be practicing their Spanish in a relaxed and chilled out environment. FIND OUT MORE ABOUT OUR STUDENT'S EXPERIENCES AT HABLA YA SPANISH SCHOOLS IN PANAMA. 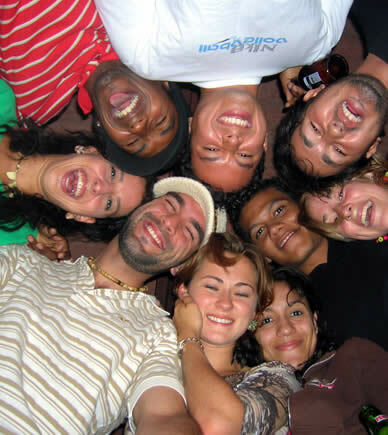 At Habla Ya we believe that one of the key factors in your Spanish learning experience is the people you get to meet. This is why we organize many different extra activities aside from your Spanish course in which our students and teachers get to hang out together and have a good time after classes. Besides, classes are not enough, you need to practice your Spanish, so why not practice and have the time of your life at the same time? One of the best things about learning a language is getting to know new people. You can start with the people that are helping you learn Spanish and also sharing with those who are learning the language with you. Making friends is something that we enjoy a lot at Habla Ya and the only part that we do not like about it is that people have to leave! The cultural exchange at our Spanish school is very valuable, and with our social and cultural activities we create the ideal environment for that cultural exchange to happen. In this way our students also learn that people from very different cultures, will always have more in common than differences. And this is why we are able to share the same community and be united.